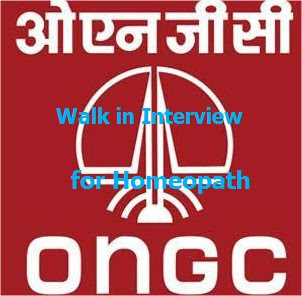 Doctor (Homeopath) For KGHC, Baroda. 01 (01 - UR ) BHMS degree from a recognized University with registration from State / Indian Homeopathic Council. Minimum 5 years experience after Registration in Homeopathic Council. `. 55000/ - per month consolidated. NOTE : - DATE DESCRIPTION TIME VENUE 12.06 .2016 ( SUNDAY ) Reporting Time for the post s at Sl.No.1 to 3 . 08.00 hrs. to 10: 0 0 hrs. Community Hall , ONGC, Makarpura Road, Baroda Reporting Time for the post at Sl.No. 4 . 10: 30 hrs. to 12 : 0 0 hrs. 1. Engagement is purely temporary on contract basis . Duration of contract is for two years i.e. from 01. 07 .201 6 to 30.06.20 18 . Contract tenure will commence from the date of joining. Selected candidates will have to s ign a contract with ONGC for the above engagement. 2. Except consolidated Honorarium per month , no other allowances will be admissible . 3. In - house OPD medical facility and premium reimbursement for floater insurance cover of ` .5.00 lacs for self, spouse and 2 dependent children/parents will be provided. 4. Notice period of one month would be required to be given from either side for termination of contractual Engagement if terminated prior to stipulate tenure period. 5. Selected candidate will not have any right whatsoever to claim for regular appointment in ONGC by virtue of working as a Contract Medics. 6. Candidate appearing for Medics should have Registration as per IMC Act - 1956 with Registration from State/Indian Medical Council . 9. Only Indian Nationals are eligible to attend interview. 10 . Reservation is applicable as per Government of India directives. 11. No TA/DA will be paid for attending the interview. 12 . Caste Certificate issued by the Competent Authority, la test non - creamy layer certificate in respect of OBC Candidates in the format placed in the site. 13. Caste Certificate issued by the Competent Authority in respect of ST candidates , in the prescribed format as placed in the web site. 14 . Engagement on contract will be subject to medical fitness. 15 . Candidates should down load the requisite application format attached and submit the same duly filled in at the time of Interview. 16. Person with Disability (OA & OL only ) candidates can also apply for the post at Sl.No.2 to 4. 17. Candidates should bring all the original Certificates of Educational Qualifications. 18 . Candidates should bring any one of the Photo Identity, such as Voter ID/Aadhar/PAN/Driving Licence. 19 Candidates should submit one set of photocopies of all Certificates and one recent passport size photograph.